New Mexico's Gov. Bill Richardson is a guy who's got the chops to be president. He was a 7-term Congressman. He was Bill Clinton's Ambassador to the United Nations and his Secretary of Energy. He's sat at the negotiating table with the North Koreans, the Palestinians and the Israelis. He's extremely charismatic and has a killer smile. He's downright likable. He just might be the smart, highly qualified guy you'd like to have a beer with. But Gov. Richardson is not your father's Democrat. He's pro-choice, pro-guns, pro-business and believes the rich get socked with too much taxes. "If you tax the rich too much they'll become destitute," he said. And that's what I like about this guy. He marches to the beat of his own drum. I joined the Governor for lunch at a friend's office Tuesday as part of a group of about a dozen influential New Yorkers who came to hear the 2008 presidential hopeful discuss the issues and hold an intimate Q&A. Richardson spoke freely and candidly about the Bush administration, the challenges America faces today, and how his 6-point plan makes him the best candidate for the job. First and most important on his list is the Iraq war. In a break with all the other Democratic candidates, he seeks a complete pullout of US troops by the end of this year. He promises a diplomatic approach that would engage the Sunnis, Shiites and Kurds in building a coalition government. He believes Iraq should be secured by a Muslim peacekeeping force. "I believe in diplomacy first and then using force second, unlike our president who believe in shooting first and then using diplomacy second." The other positions he discussed, on subjects ranging from energy and the environment to education, health care and jobs creation, are well documented and can be explored on his website. Rather than regurgitate them here, let me just say he makes an awful lot of sense and brings a creative, sincere approach to the process. Talking with him is like talking with a real guy, not a political automaton. Washington could use a fresh thinker like Richardson. He talks of his political "fate" in no uncertain terms when refering to the 'big event' that will likely thrust him into the "first tier" while bouncing one of the current front-runners into the second. Though he cannot articulate just what that event actually will be. Pretty trippy stuff, but you get the sense that he truly believes in his own brand of karma. 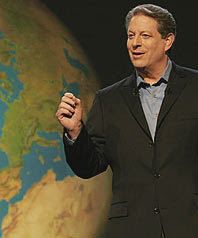 Readers of this blog know of my staunch support of Al Gore and my prediction that he will enter the race by October. I asked Richardson if he thought Gore would run, and if he would leapfrog to the head of the pack if he did. The Governor joked that "I don't want him to run!" Actually, I don't think he was joking at all. He said Gore would be a "formidable" opponent, but that he didn't think (read: hope) he would run. That said, should The Goracle continue to lambaste Bush and sound the global warming alarm from afar and not toss his hat into the ring, I could easily throw my support to the affable Governor from New Mexico. Take a look at Richardson. He could very well be the Dems' dark horse candidate. Adrienne's film "Waitress" opened in theatres May 2nd to incredible rave reviews from the NY Times, LA Times, USA Today, Wall Street Journal, Newsweek, Time, People, Entertainment Weekly, Ebert & Roeper ("Two Thumbs Up"), Leonard Maltin and more. In its first weekend, its gross-per-screen finished second to Spiderman 3. It's a truly wonderful film that you're sure to love. A link to the trailer is below. Enjoy.